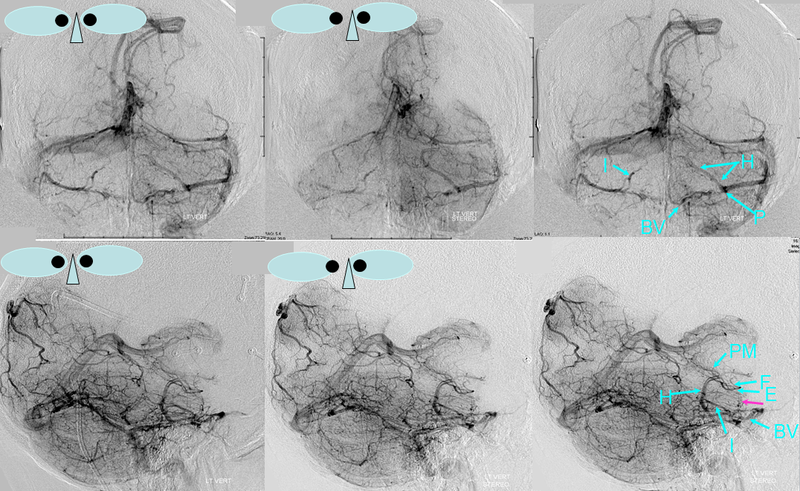 Whatever its name, this important and relatively constant longitudinal venous conduit connects the basal vein (or posterior mesencephalic vein) at the upper aspect of the midbrain to the petrosal vein (P) at the level of the lower pons. Thus, it serves as a conduit between the superior group of veins which usually drain into the Galen to the anterior group which drains into the Petrosal Vein (P) and frequently via bridging veins (BR) into the cavernous sinus. 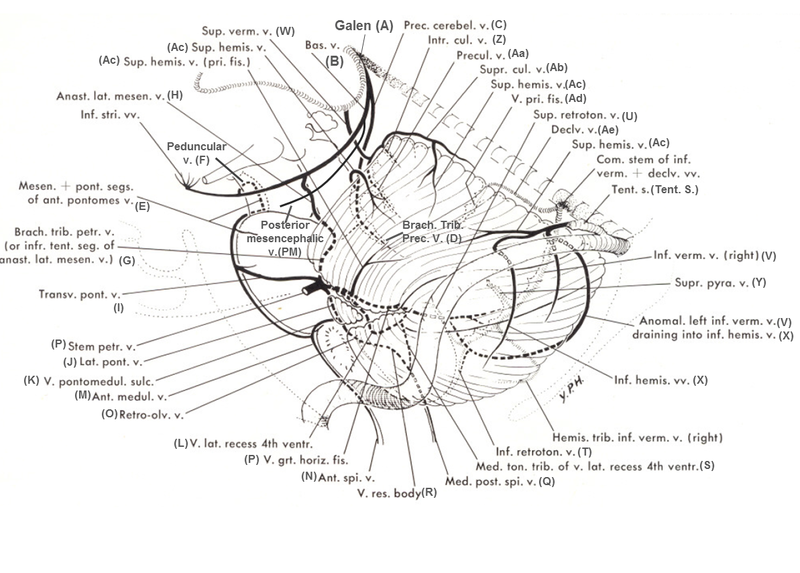 In Albert Rhoton, The Posterior Fossa Veins, Neurosurgery. 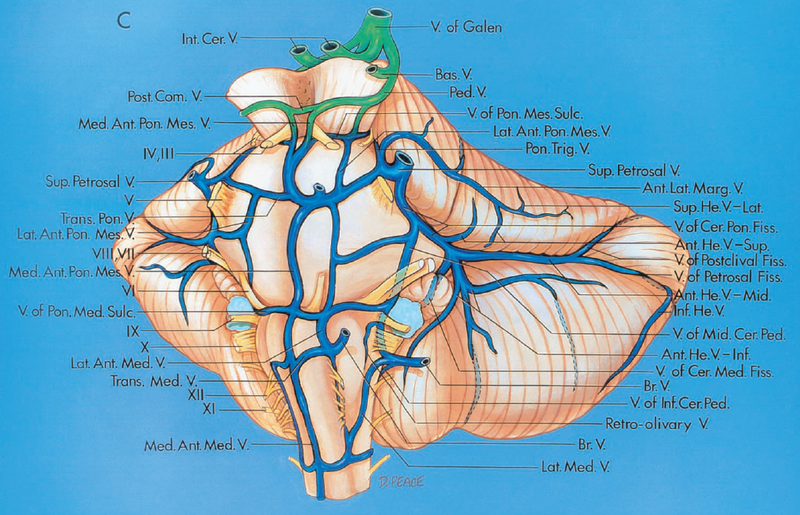 2000 Sep;47(3 Suppl):S69-92, the Lateral Mesencephalic vein corresponds to the Anastomotic Lateral Mesencephalic Vein (H) of Huang, while the Pontotrigeminal Vein corresponds to the Brachial Tributary of Petrosal Vein (G) of Huang. As usual with veins, variation is the rule. In its full expression, the Lateral Mesencephalic vein is a contiguous channel between the aforementioned basal vein and Petrosal vein (P). However, just like the case with many veins, parts of it may be more or less developed. 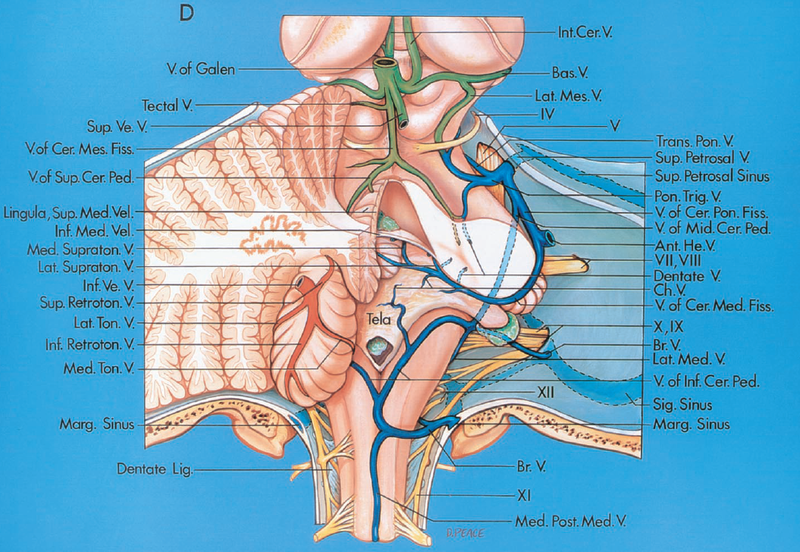 Similar to the situation with the basal vein, which should be thought of as a conduit between the cavernous sinus and the vein of Galen, and which may be hypoplastic at either end or in the middle, thus draining anteriorly towards the cavernous sinus rather than “normally” into Galen; the Lateral Mesencephalic vein frequently does the same thing. However, unlike the basal vein, depending on its disposition it will have different names, hence the confusion. The upper part of the vein is the “Lateral Mesencephalic Vein” proper, as it is located on the lateral surface of the mesencephalon, and it is designated as (H). When the upper part of the vein is hypoplastic, without connection to the basal vein or posterior mesencephalic vein, only the lower portion draining into the Petrosal Vein exists, in which case the Lateral Mesencephalic Vein instead called the “Brachial Tributary of the Petrosal Vein” (G) since this part is located on the surface of the middle cerebellar peduncle. From a neurosurgical perspective, Rhoton calls (G) the Pontotrigeminal Vein (based on older neurosurgical literature, and because this vein is located immediately adjacent to the roots of the trigeminal nerve). Whatever the name, it is the same vein. The opposite can be seen also, where the lower part of the Lateral Mesencephalic Vein is absent, and it drains primarily towards the basal vein. The (G) and (H) parts of the vein are shown below. 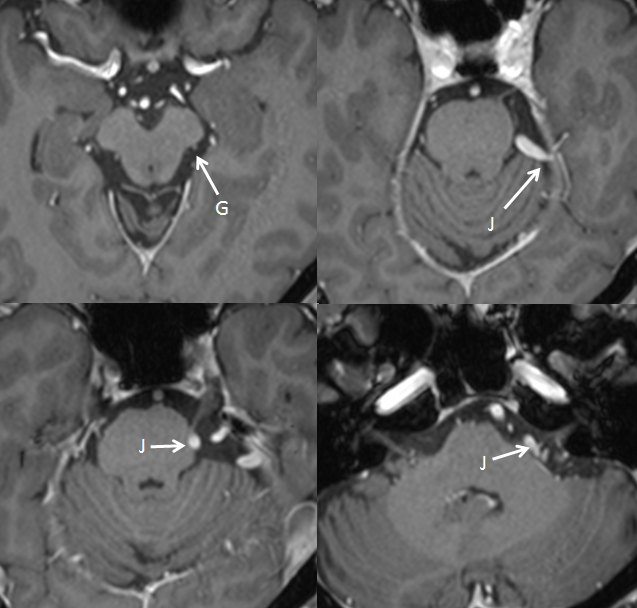 The (H) is on the lateral mesencephalic surface, the (G) is on the surface of the middle cerebellar peduncle. On occasion, when the Posterior Mesencephalic (PM) is hypoplastic the Lateral Mesencephalic can collect its territory, including the Peduncular Vein (F) to drain into the Petrosal vein (P), as shown below. 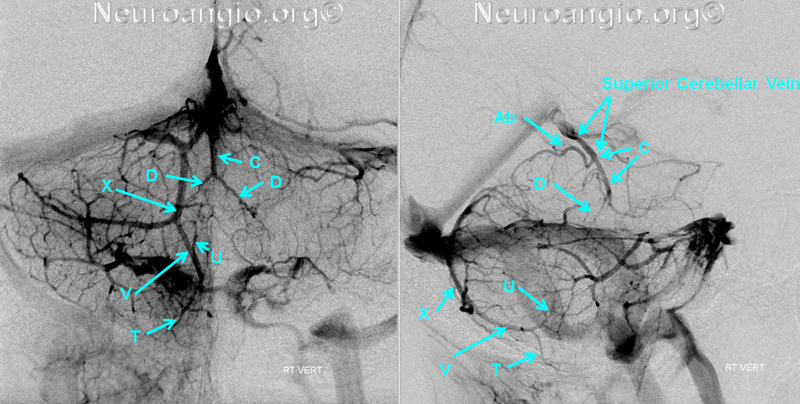 Notice also a large Bridging Vein (BV) connecting the relatively hypoplastic anterior pontomesencephalic group to the cavernous sinus. The beginner should be careful not to confuse this vein with the anterior pontomesencephalic vein (E) which is located well more anteriorly next to the basilar artery, and marks the anterior aspect of the brainstem. Checking for the location of the basilar artery, which can be done in many ways, including by making the arterial phase a “mask image”, as shown below, can help. 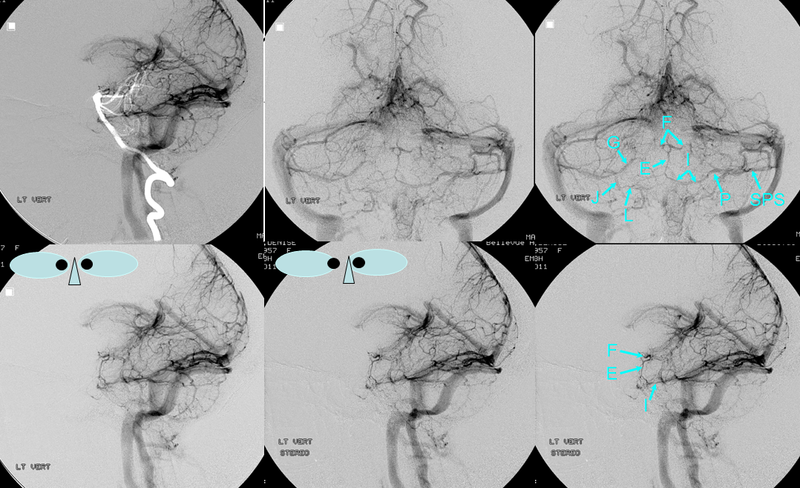 The upper left image is taken with the arterial phase selected as a “mask” to superimpose the anterior pontomesencephalic (E) vein onto the basilar artery. Notice that in this patient the (E) group is dominant, and thus the lateral mesencephalic vein (I) is correspondingly hypoplastic. Also well seen is the Vein of the Lateral Recess (L), a.k.a. the cerebellomedullary sulcus vein. A 7 Tesla T2 axial image shows absolutely stunning anatomy, including veins. 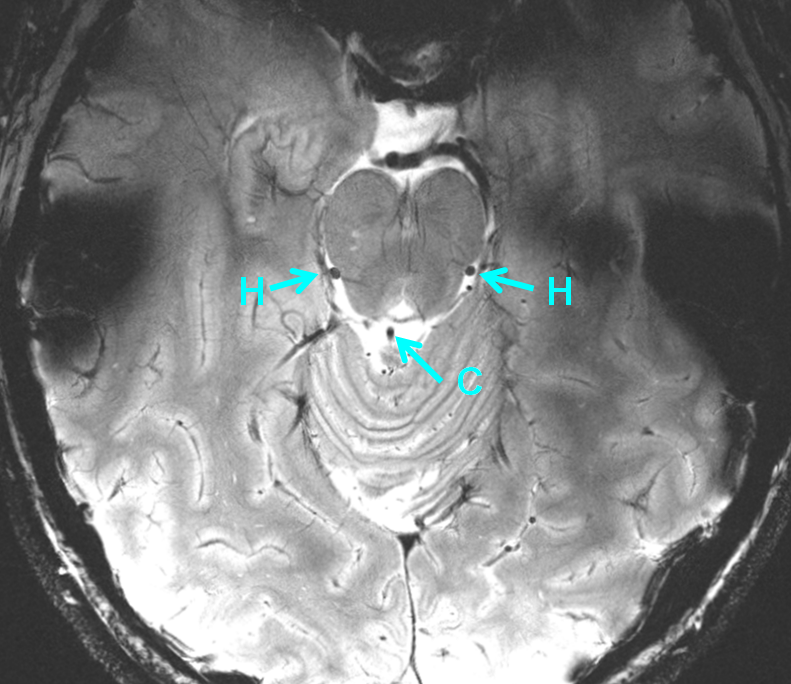 Prominent Lateral Mesencephalic Veins (H) and Precentral Vein (C) are shown. There is obvious compression of the left trigeminal root zone (yellow), which is flattened and anteriorly displaced. Notice a tiny, physiologically normal lateral pontine vein ventral to the right of CN V on CISS and T1-postcontrast images.